Ah, the digital age is upon us. I think Chinese learning, and language learning in general is getting very exciting lately. It became even more exciting, when I received a tweet, this weekend, from an acquaintance studying in Taiwan at the moment. His wife went with me on my trip to Beijing in 2009. Without further ado, I introduce ChineseLevel. It offers a quick test, that tracks how many words you know. Apparently I can read 80% of newspapers! The site then recommends you articles based on your level. That's the initial core functionality of it. Having only just launched, a bright future lies ahead for ChineseLevel. Herman Schaaf, the creator of the site, did some research himself into reading Chinese newspapers. Check out his research results. I feel there's a lot more to add in terms of features, but it's a slick design and great offering for an initial launch. Be sure to sign up and keep track of ChineseLevel. Another site that I've been beta testing, 3000hanzi, by Steven of Lingomi, is also looking for a launch this week. They've got similar ideas, aiding learners with Chinese reading development. We all know that is a tough job! Here's to a brighter Chinese future. 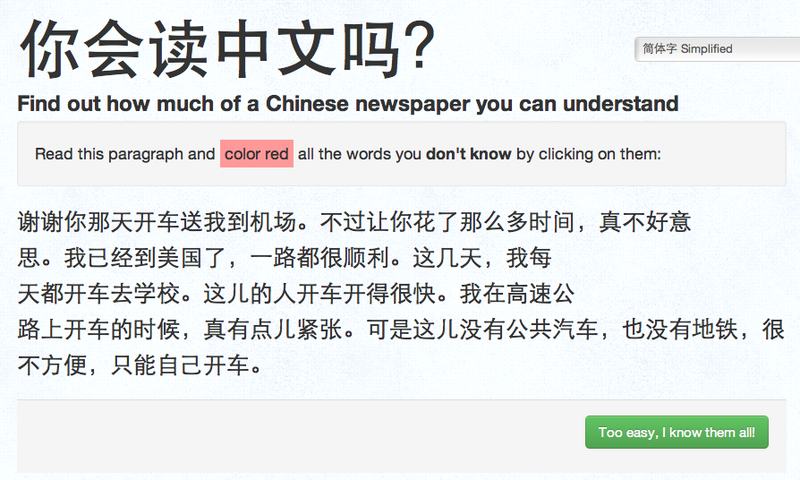 And hopefully we'll be reading Chinese newspapers in no time.